Halloween Cake Recipe | A Spooktacular Treat For Your Party! 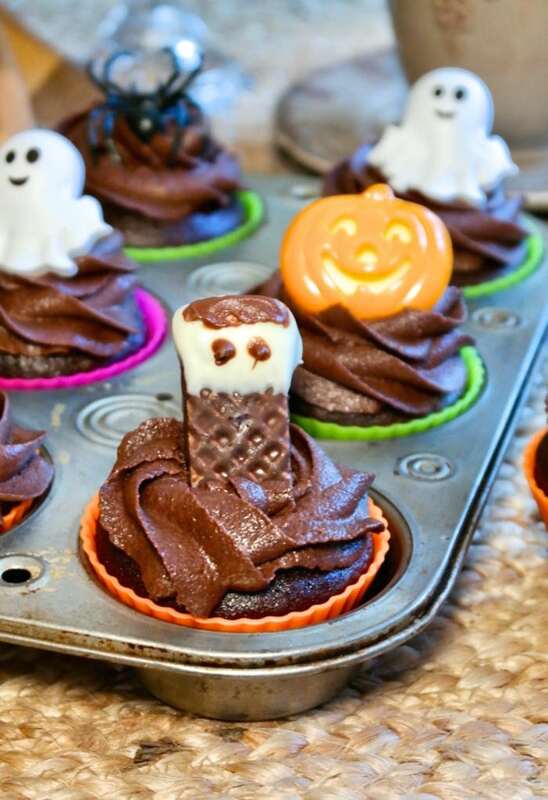 Looking for a fun halloween cake or cupcakes you can make with kids? 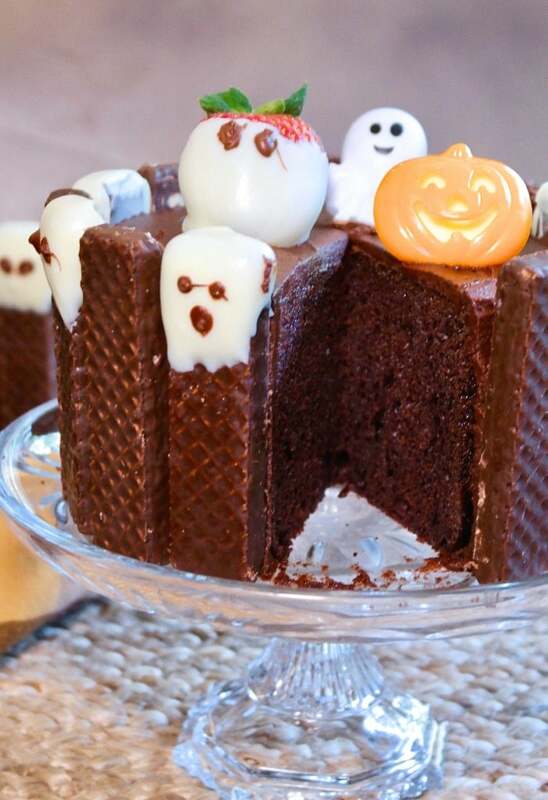 This ghost theme recipe will make one large cake or a mini cake with cupcakes! Guuuys, isn’t this cake sooo adorable? For special occasions like some halloween fun and birthdays I bake up the most decadent desserts. Baking breads like banana bread with chocolate chips is easy and fun, but when branching out to decorate cakes, I stick with sprinkles or gooey chocolate like you see here on this Best Boston Cream Cake. It takes some real baking skills to get swirly pretty roses and such. Also, cake decorating takes a lot of practice, which I haven’t fully developed. You too? Well, I have just the right halloween treat that will be the star of your halloween gathering, and you don’t have to be a baking pro to make this delicious cake! The chocolate frosting and cake is from my go-to favorite cake, Rocky Road Cake. Like any cake you bake from scratch, it’s not hard to make. It just takes patience to measure and mix all the ingredients up. I used a 5 x 3 small cake pan for the main cake, and then used the remaining batter for cupcakes. Cupcakes are really convenient for serving at a gathering. No utensils needed! 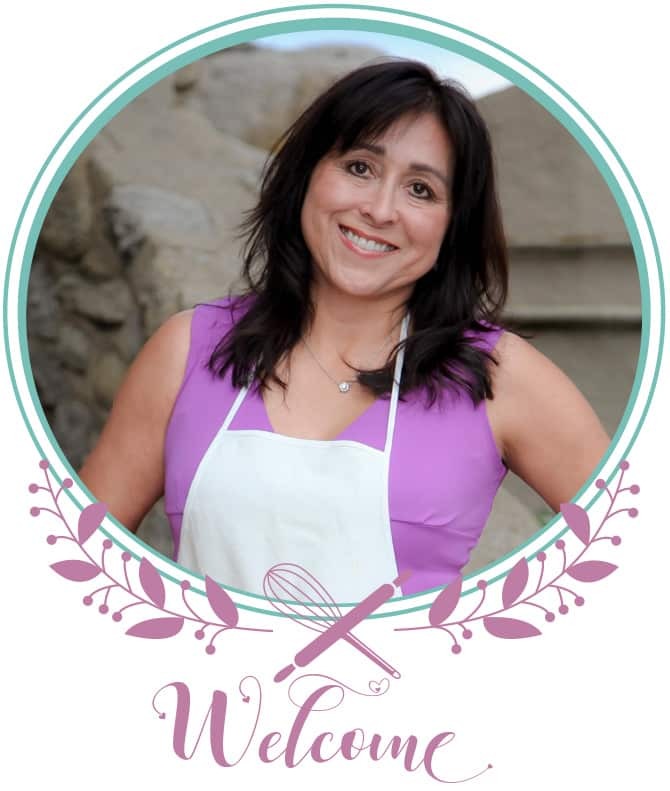 Depending on your occasion, you can also make a large cake using two 8-inch round pans with the same great results! Before diving into this recipe gather all the ingredients, including the cake toppers. Once you’re all set, then bake the cake and let it cool. While the cake is cooling make the frosting and set it aside. Next, make the chocolate ghost wafers. I’m using Voortman Bakery’s newest collection of fudge coated wafers to make ghost faces that are placed around the cake. You can mix up the delicious wafer flavors if you would like. 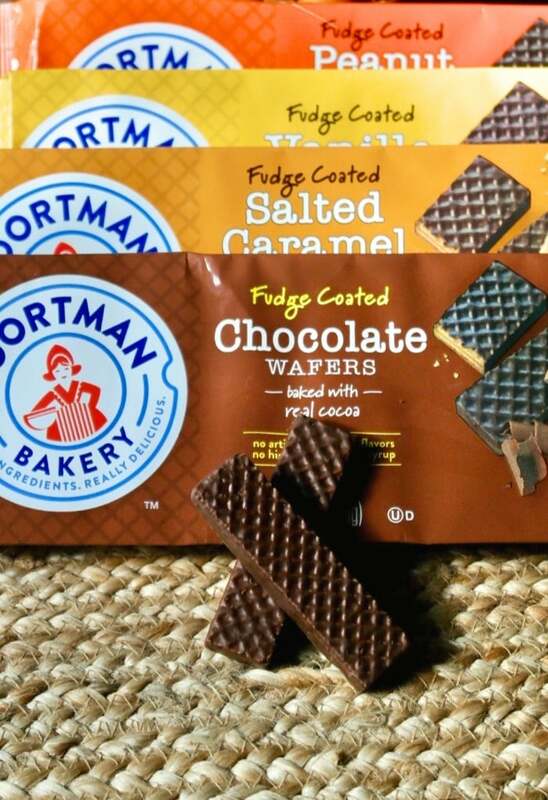 There are a variety of fudge coated wafers to choose from: Peanut Butter, Vanilla, Salted Caramel and Chocolate. They’re all amazing tasting, which is what you would expect from a company that uses real ingredients! 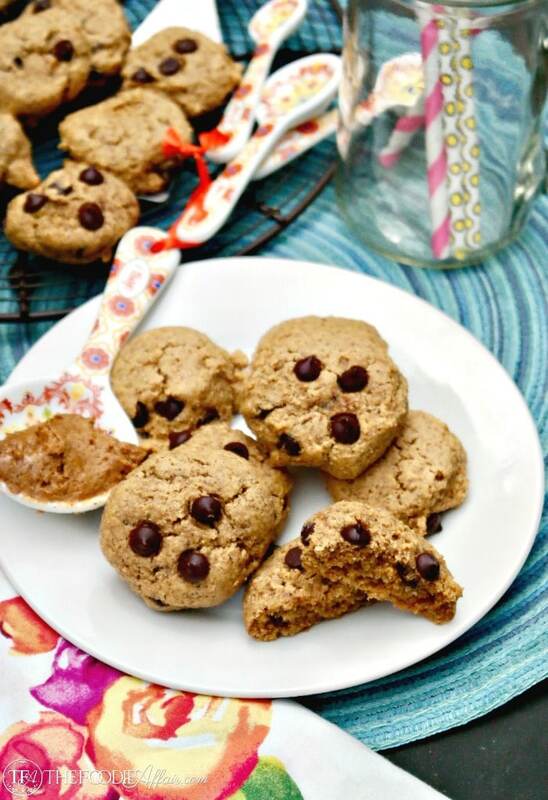 No artificial colors, flavors, high-fructose corn syrup, or trans-fat in their goodies. Hooray! They mirror my kind of baking! I also picked up some plastic halloween rings that I’m using to add to the top of the cake along with strawberries just in case I had extra melted white chocolate to use up! Making the ghosts are super easy for being so cute, right? All you need is some white chocolate chips. Melt them up and dip each wafer coating a portion of the cookie. Place them on a baking sheet to harden. 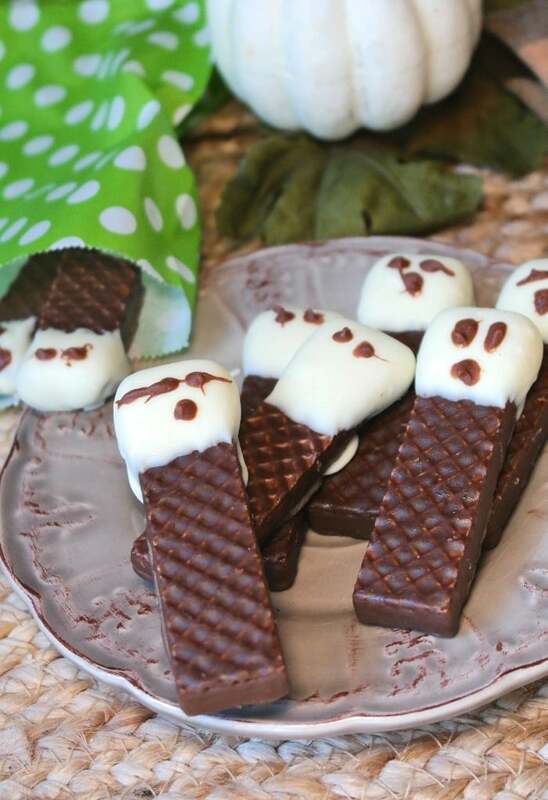 Meanwhile, melt some milk chocolate and then use a skewer or toothpick to dip it into the chocolate, then make ghost faces (give the kids this job)! No two faces are alike, so don’t stress if you give a ghost a unibrow. They’re cool with it, k? Once the ghosts are ready you can start putting the cake together. Frost the cake (no fancy swirls needed), then place the ghosts around the cake. Add a couple of toppers to finish it off and you have one SPOOKTACULAR cake! The remaining frosting was used for the cupcakes and just like the cake, I added a wafer ghost and halloween rings as decor! Easy and adorable! Extra ghosts? Pack them up and give them to the neighborhood kids or bring them to your co-workers like I did! They’ll disappear in no time! 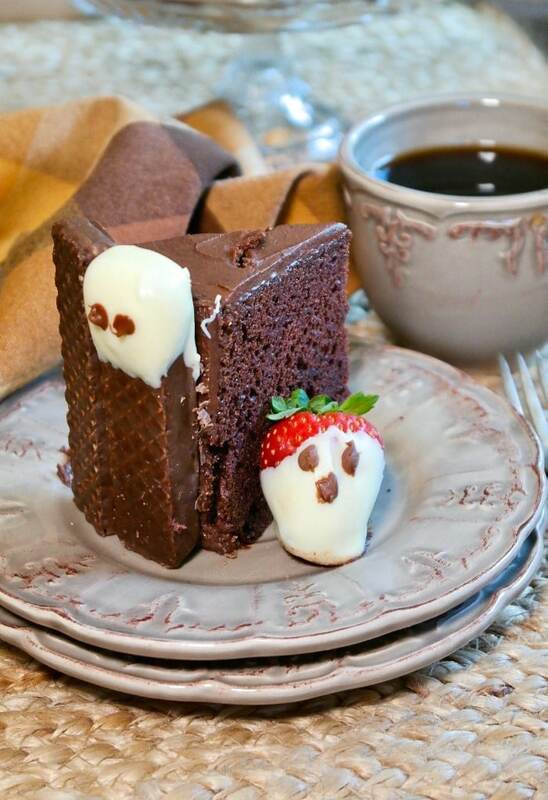 Make this spooktacular halloween cake for your next party! This rich chocolate from scratch recipe can be incorporated into all cupcakes or make a small cake with cupcakes! Preheat over to 350 degrees. Make cake and frosting according to the Rocky Road Cake directions. cupcakes - bake for 15-20 minutes. 8-9" cake bake for 35-40 minutes. Melt chocolate(s) separately in a double broiler or microwave safe bowl on medium high for about 1 minute. Remove and stir and place back in microwave for 15 seconds. Repeat until chocolate is smooth. Dip fudge wafer in the chocolate and place on a baking sheet lined with parchment or wax paper. Once set dip toothpick or skewer in milk chocolate and form a ghost face. Let harden. After cake is cooled and frosted place on a serving plate and place ghosts around cake (you may want to separate the ghosts with a pain fudge wafer). Top with ghost strawberry (optional) and plastic halloween ring decorations. Add ribbon around cake (optional) or any other festive decorations! Enjoy. Optional - fresh strawberries to dip with extra white chocolate. This cake is adorable! I have those wafers in my pantry and now you inspired me to create some spooky treats. Thanks! This cake really is adorable, and, I love that it’s simple to make, and looks yummy, too. This is such a creative cake!! I love the ghosts. The biscuits and strawberries look great and I think it is perfect for halloween!! 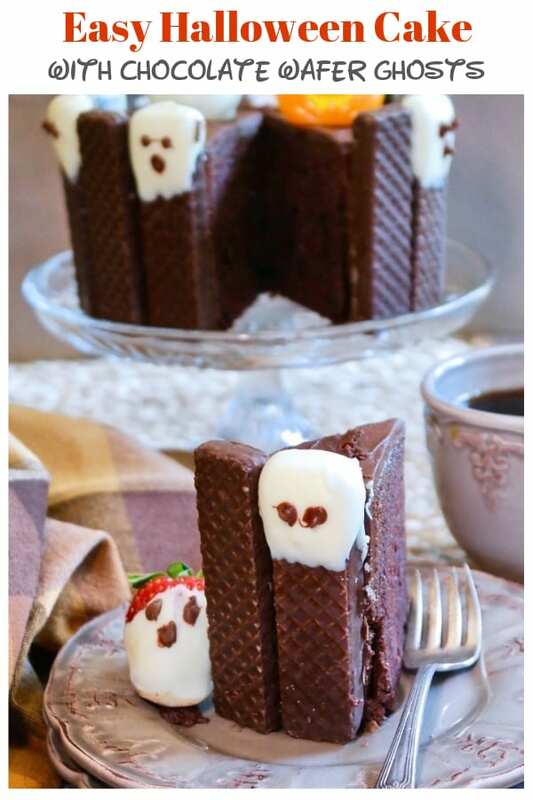 Haha, that’s a fun Halloween cake recipe, the strawberry ghosts are ingenious! Oh god this cake is incredible! Wow, I want to eat it every day! I’m sure this is very tasty. This is a great recipe for me. What a fun idea for wafers! I love the little ghost faces! My 5 year old would love to help make this. She has been taking Halloween so seriously this year, She has “spooked” her boher everyday after school for a month now! HA! 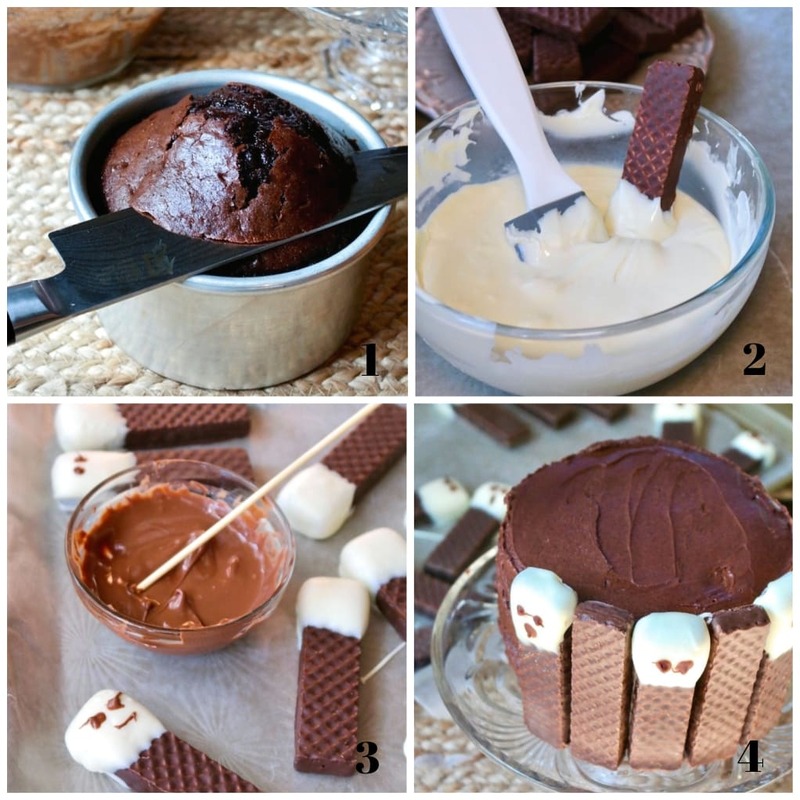 What a cute idea for halloween and tasty as well. This is perfect for me to do with my niece over the weekend. Its something totally doable and how cute they end up! Spooky treats rock. This cake is so much fun. My niece will love it. This is such a cute idea for a Halloween party! I can’t wait to make this! How fun! This is a must make for Halloween! Those little cookie ghosts are soooo cute! It’s a fun one to make and hard to resist a chocolate treat! 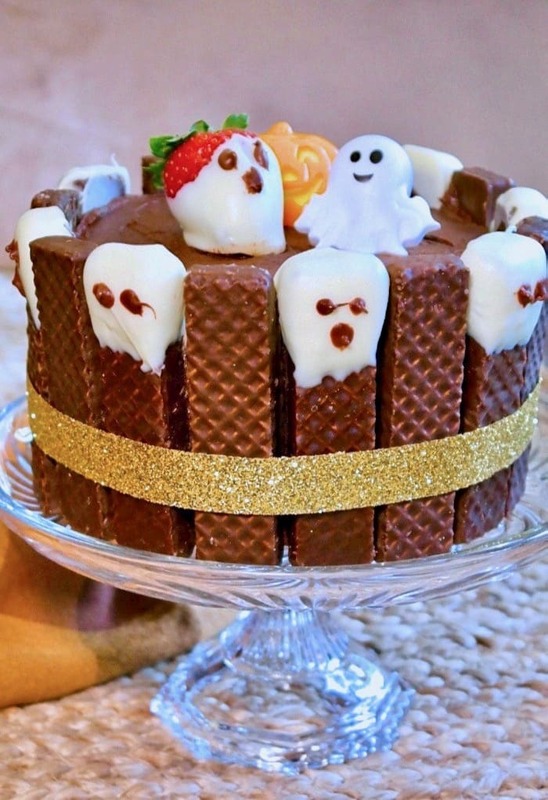 This is such a fun and spooktacular cake! The cookie ghosts are so adorable! You are so so creative! this cake looks delicious and so fun!! Going to make this this weekend! I think my boys will be very impressed! Cake decorating is so not my thing. I think I could even pull this off with our really simple to follow directions!! This is SO FUN!